This 2018 Chevy Camaro is more than just a muscle car. It's a true sports car thanks to its sharp, agile handling. 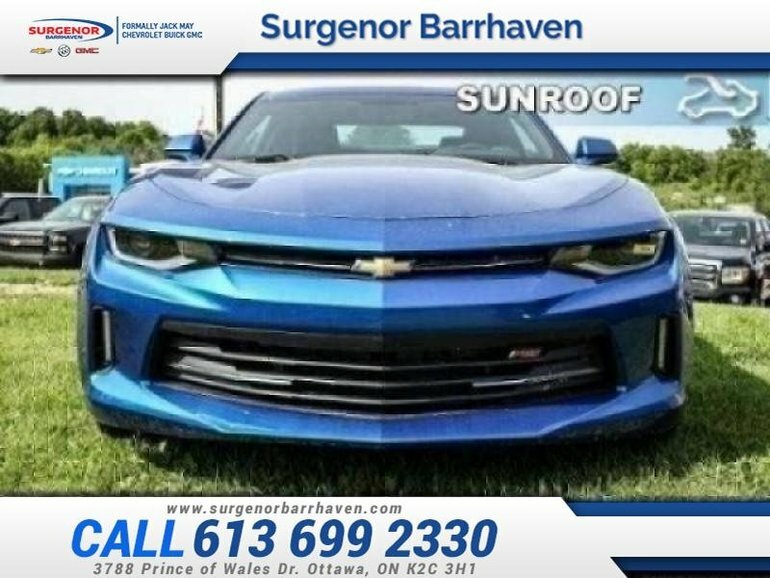 This 2018 Chevrolet Camaro is for sale today in Ottawa. Built around a smaller, lighter architecture than the previous generation, this 2018 Chevrolet Camaro sports car takes full advantage of its tighter proportions with more responsive braking, better attack in and out of the corners and more nimble driving performance. The smaller, more athletic sixth-generation Camaro also features a fastback profile with more pronounced quarter panels, creating a road presence that's hard to ignore. This low mileage coupe has just 87 kms and is a Certified Pre-Owned vehicle. It's hyper blue metallic in colour. It has an automatic transmission and is powered by a 2.0L I4 16V GDI DOHC Turbo engine. This vehicle has been upgraded with the following features: Sunroof, 20 Inch Black Aluminum Wheels. It has a certified used vehicle warranty for added peace of mind. Buy this vehicle now for the lowest bi-weekly payment of $215.58 with $0 down for 84 months @ 6.99% APR O.A.C. ( Plus applicable taxes - Plus applicable fees ). See dealer for details. Interested in the 2018 Chevrolet Camaro LT - Certified - Sunroof - $215.58 B/W ?